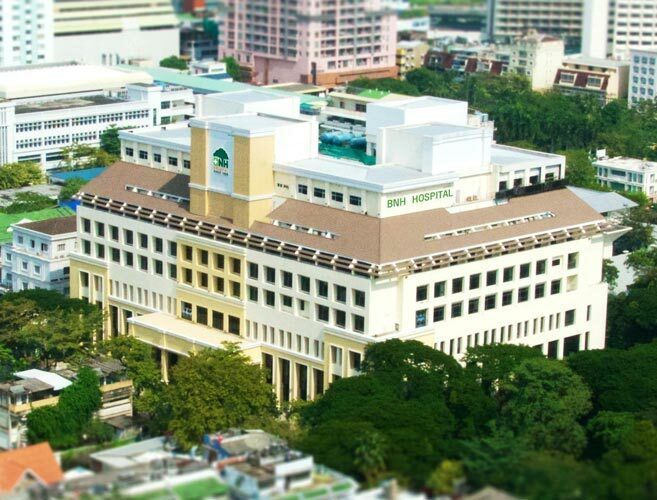 BNH Hospital was founded in Bangkok in 1898 and was originally named the British Nursing Home Hospital to provide nursing care to Thais and expats. It became one of the first private hospitals to open in Thailand and is currently celebrating its 120th anniversary. In 1996 it opened a new complex on Convent Road in the central Bangkok area of Silom and was renamed to BNH Hospital. It is Joint Commission International (JCI) accredited and is a part of the Bangkok Dusit Medical Services (BDMS) healthcare group, the largest hospital group in Thailand, which also operates Bangkok Hospital, Samitivej Hospitals, and Phyathai Hospitals among others. Twenty six of the BDMS hospitals are JCI accredited. Its fertility treatment clinic for couples offers a range of investigations and procedures to assist with reproduction. BNH Hospital is located at the southwest side of Lumpini Park in the Silom area and can be reached using the BTS Skytrain from Silom Station. The Silom area is the financial district of Bangkok with top hotels and restaurants.